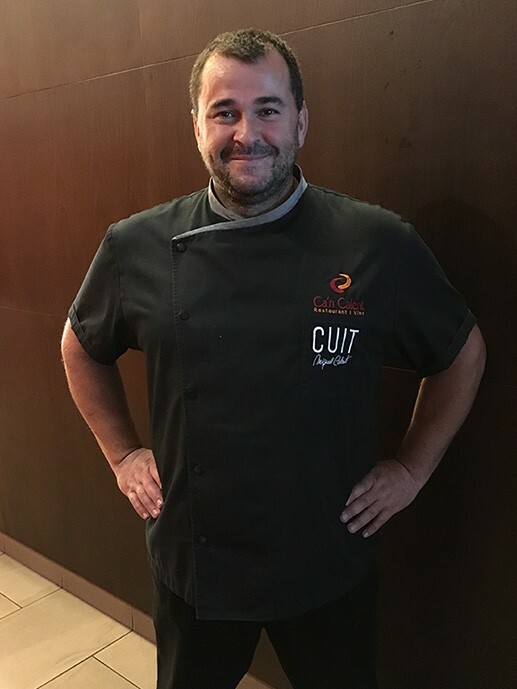 In this interview we would like to present our Chef, the director of CUIT Restaurant, who´s in charge of offering culinary surprises to each and every client who decides to visit NAKAR Hotel. Participant and representative of Balearic gastronomy in fairs such as FITUR (International Tourism Fair of Madid), BIOFACH (International fair of eco-friendly cooking, Nuremberg, Germany), and LO MEJOR DE LA GASTRONOMÍA (Bilbao). He is also a regular collaborator of written press, radio and television in different autonomic aspects.Also the co-author of the book “Aguiantamb el Cançoner”, about gastronomy and Mallorcan culture. Other significant accolades include being a member and speaker of EUROTOQUES Baleares, Honored associate of ASCAIB (association of affiliated chefs in the Balearic Islands), Insignia of Honor of the Acadèmia de la Cuinaidel Vi de Mallora (Mallorcan Academy of Cooking and Wine). Coming up, he´s going to answer some questions to explain what his style of cooking consists of, and how he wishes to surprise us in CUIT Restaurant at NAKAR Hotel. First of all, good morning Miquel and thank you for answering our questions. Cooking is probably the nicest way to let someone know you care about them. In my case this special someone is the client. I always explain to the people who form part of my team to cook as if they were cooking for their loved ones, and I think that´s where the difference lies, in the love. Which are your roots in the cooking world? What influenced you when deciding to be a chef? My cooking is rooted to the land which surrounds it, in other words Mallorca, but also in a wider context, obviously the Balearic Islands and all of the Mediterranean. I learned to cook standing on a box, because I couldn´t reach the top of the stove, in my Grandma´s family business. What do you wish to transmit at CUIT Restaurant? I constantly repeat that, a diner seeing the dishes which are being served in a restaurant should be able to feel identified with which surrounds them and with the time of year. At CUIT we´re going to propose modern seasonal cooking, with roots deeply anchored in tradition. A vision which wishes to surpass the typical stereotypes attributed to our gastronomy, to re-discover and present antique recipes in new contexts. Lots of times, when it comes to cooking, food is experimented with using all types of new processes, some chemical and others natural. Does your kitchen experiment with traditional elements or do you prefer a more vanguard style? My opinion is that this topic has been talked about a lot and not in the right way. I think that a chef has a wide range of techniques at his disposal to better a prime matter, which is the real protagonist. I don´t think it´s relevant if the technique or techniques are used are a thousand years old or just ten. For us it´s vital to have a range of suppliers, practically all of them local, to be able to receive products of great quality, with character, closeness and differentiated. The way of treating these foods is always subject to them. Do you think the gastronomic fusion of different cultures is better for discovering new tastes or being centered in a unique culture/style of cooking? I think cooking is a passion, a feeling, a state of mind… therefore I respect the interpretation which each individual wishes to take on. When it comes to CUIT, we opt for cooking with our own roots, with a large presence of local and endemic varieties, all of them updated with a cosmopolitan view. Could you tell us about some of the dishes you have planned for CUIT? Which are the products we´ll be able to see more frequently at the Restaurant? CUIT´s menu will vary depending on the season, always subject to the market. It´s menu will be varied, trying to appeal and please all types of taste buds. Local varieties of rice, meats, fish and some vegetarian dishes, desserts… all treated with a 100% artisan vision of gastronomy. To finish up, what does this new project mean to you? For our team, CUIT means to be able to develop our own way of understanding gastronomy in a new context, a space designed for you to enjoy, in the best area of Palma, where modern and tradition live together in harmony to form the present. Definitely an exciting, dedicated and demanding challenge all at the same time.